In Dynamics 365 for Customer Engagement, you use activities to keep track of all your customer communications. For example, you can take notes, send email, make phone calls, set up appointments, and assign yourself tasks as you work a sale or resolve a service case. These actions are all considered types of activities. The system automatically timestamps every activity and shows who created it. You and other people on your team can scroll through the activities to see the history as you work with a customer. 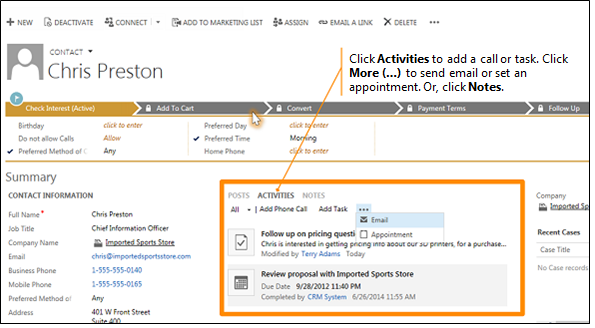 To get the most out of Dynamics 365 for Customer Engagement, it’s important for everyone in the organization to track all their customer interactions by adding an activity for every email, phone call, task, or appointment. That way, a customer’s history is complete. Add activities to your reports to track your ongoing progress. In Dynamics 365 for Customer Engagement, you use Activities to keep track of all your customer communications. For example, you can take notes, send email, make phone calls, set up appointments, assign yourself tasks as you resolve a service case, and stay up-to-date with customer news. These actions are all considered types of activities. To add phone call details, tasks, notes, and more see: Add a phone call, task, email, or appointment activity to a case or record. 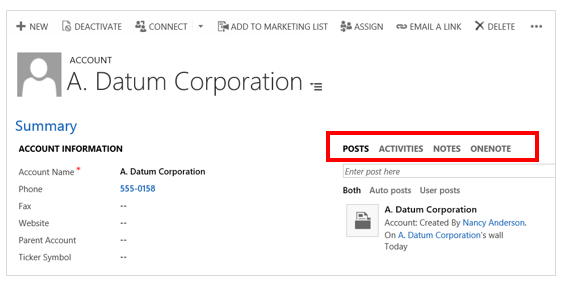 To stay up-to-date with your activity feeds, see: Stay up-to-date with customer news with the activity feed. To send email, your email must be configured correctly. More information: Why does the email message I sent have a "Pending Send" status? You can find your activities under My Work. Once there, click the Activities icon (Dynamics 365 for Customer Engagement) or the Activities tile (Microsoft Dynamics CRM). You can view all of the activities assigned to you, or you can view only certain types of activities (for example only tasks, or only phone calls). Click the down arrow next to My Activities, and then select All Activities, or select the activity type you want (for example, Email). You can filter the list of activities to see only the ones you’re interested in. For example, filter the list to see closed activities, or to see activities assigned to other people on your team. Click the down arrow next to My Activities and then point to All Activities to include all the activity types, or point to the activity type you want (for example, Email or Phone Call). Click the right arrow on the drop-down list, and then select the view you want. The views that are available depend on the type of activity. As your organization’s relationship with a customer builds over time, you and other people on your team can look through the activity feed as you work with the customer, and see the history of your interactions. Activities can also be included in reports to track your ongoing progress. Open the record. You can use Quick Search on the navigation bar to find a record quickly. Click Activities to add a task or phone call to the record. Click More (…) to add an email or appointment. Or, click Notes, and then start typing. Add a task or note for yourself when you want a reminder to do something personal, like schedule a doctor’s appointment or attend a sporting event. Otherwise, to keep a history of your interactions with a customer, you should add new activities that are associated with a customer’s record, so those activities become part of the history that other people on your team can view. On the nav bar, click Create, and then click the icon or tile for the activity. Documents, spreadsheets, pictures, and just about any type of file can be attached to notes or tasks. Open the note or task. Browse to and then click the file that you want to attach, and then click Done. After you call someone, complete a task, send an email, or go to an appointment, you can mark the activity for that action as completed. On the command bar, click Mark Complete. On the list of activities, click to the left of each activity to select it. On the command bar, click More commands (…), and then select Mark Complete. Add an activity for every customer interaction. Make sure a customer’s history includes a record of every communication you have with them. However, you should add an email or phone call activity to track those types of actions, and use notes for more general text. Add activities for yourself, too. You can keep track of your own assignments, events, and notes without associating these activities with a customer. Use the Create command on the nav bar. Find these activities in the list by sorting on the Regarding column, which is blank to let you know that the activity isn’t associated with a customer record. Keep in mind that activities “roll up” under their associated records. Let’s say you want to remind yourself to follow up with Chris Preston, a contact who’s associated with the account, Imported Sports. You’ll need to add the task activity to the contact record for Chris (not for the account, Imported Sports).